Coated in black paint, the Nike SB Blazer Low GT NBA takes DIY to a new level. The paint fades as you skate, revealing a blue leather upper and a yellow Swoosh design trademark—colours inspired by your favourite NBA team. Solid rubber outsole in a herringbone pattern provides excellent traction and boardfeel. Vulcanised construction offers flexibility and excellent grip. Traditional lacing offers a snug, secure fit. Paint-coated upper fades with wear to reveal the colours of your favourite NBA team. Have your say. 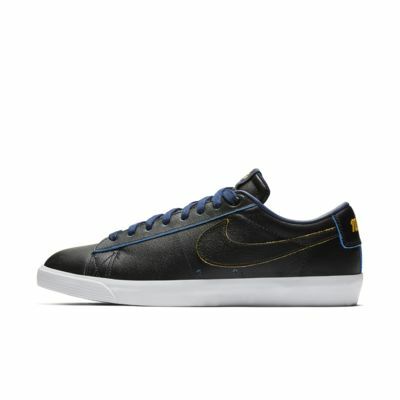 Be the first to review the Nike SB Blazer Low GT NBA.